As it's coming up to bonfire night, I wanted to create a delicious and comforting treat. 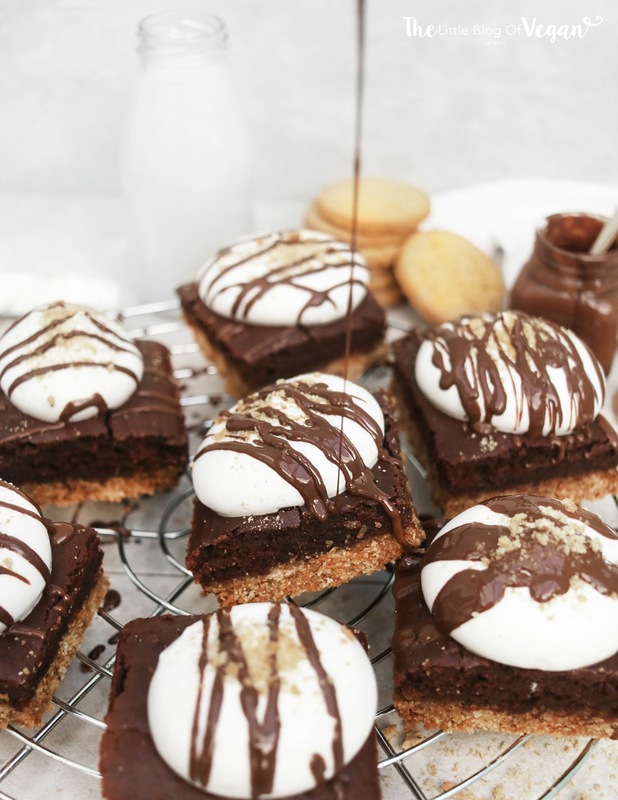 Smore's are an American campfire dessert that I took inspiration from and I wanted to base a recipe on them! 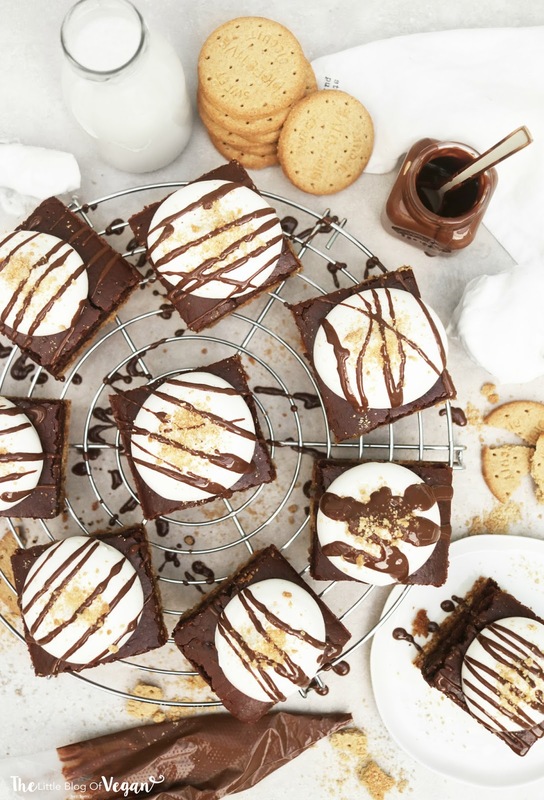 I've made these smore brownies with a crunchy biscuit base, topped off with my own vegan & GF brownie which is chewy & fudgy, with a bulb of homemade marshmallow fluff. I even drizzled on melted dark chocolate and crumbled cookies to make it even more rich & luxurious. YUM!!! These are some of the tastiest and moorish dessert's I've had in a long time!! I highly recommend you make these!! Step 1- Line a 10 inch square baking tin with greaseproof paper. Step 2- Add the biscuits into a food processor and whizz up until crumb like, leaving a few larger chunks. Step 4- Place the butter and maple syrup into a small saucepan on low and heat until fully melted. Step 6- Pour the mixture into the lined tin and press down until compact then set aside. Step 1- Pre-heat your oven to 180 degrees c.
Step 2- Sieve the cocoa powder & flour into a large mixing bowl and stir in the salt & sugar. 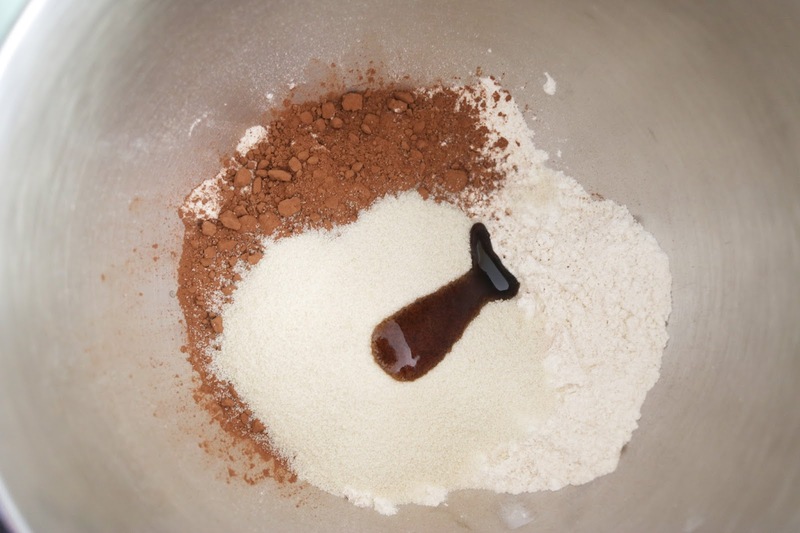 Mix until fully combined, then add 1 teaspoon of vanilla essence & mix in. 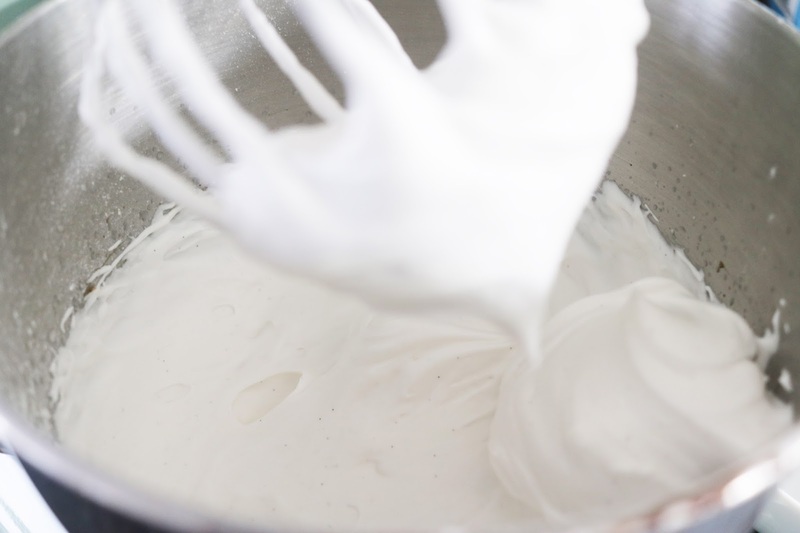 Step 3- Pour into the mixing bowl the oil & dairy-free milk. Mix until fully combined and looking heavenly. Step 4- Spoon the brownie mixture ontop of the cookie base and level out, making sure you get into the edges. i like to use a pallet knife. Step 5- Pop the tin into the middle of the oven and bake for 20-25 minutes. 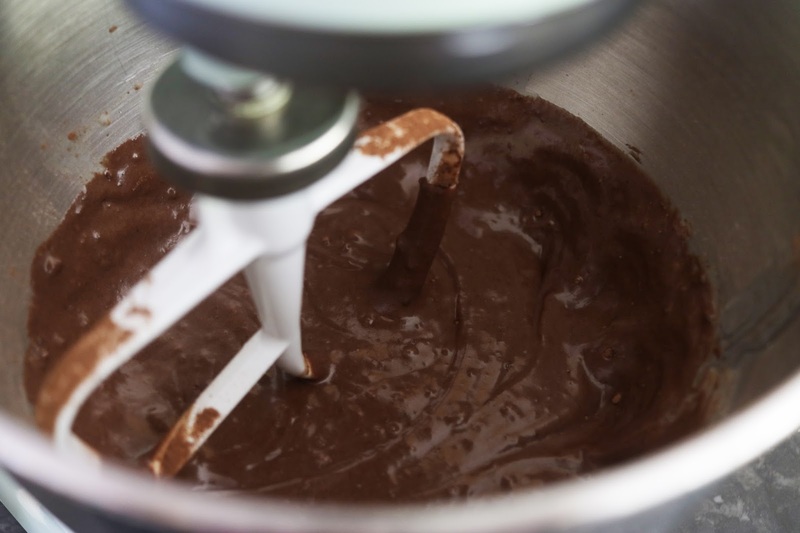 To make sure the brownies are baked, place a sharp knife or skewer into the centre until it comes out clean. If they are not fully baked, pop them back in the oven for an extra few minutes. Step 2- Add in the sugar and continue to whizz up until stiff meringue forms. Step 4- Pop into a piping bag fitted with a round tip nozzle. 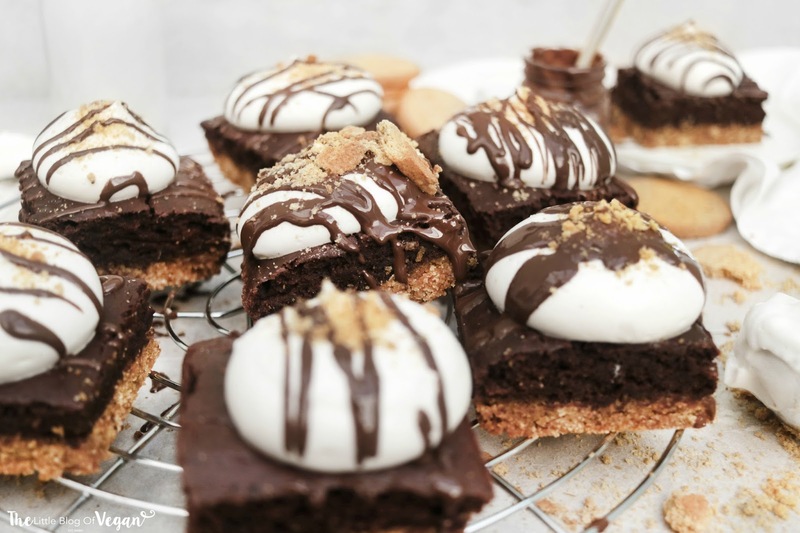 Step 5- When the brownie is cool, cut into squares and pipe a ball of the marshmallow fluff onto each brownie. 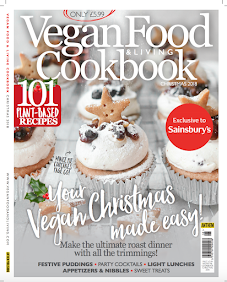 Top off with a drizzle of melted dark chocolate and crumbled cookies. You could even toast the marshmallow.